Sterile Set designed for dressing the patient; ideal in all periodontal surgery, dental implant surgery and maxillofacial operations. The set is packed in a sterile double wrapping, wrapped in medical grade paper, and the gown is without cuffs for greater patient comfort. The convenient detachable label allows easy traceability of the operation. 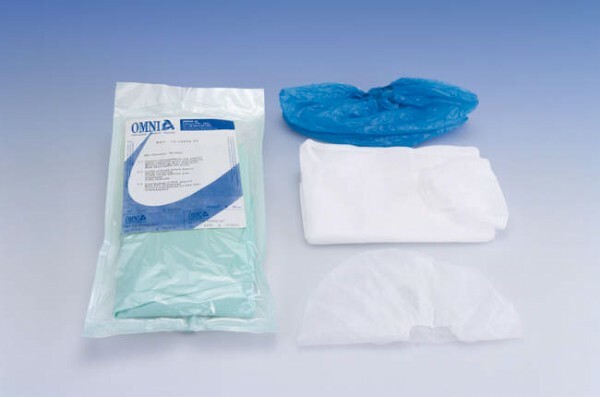 Each set consists of: 1 Water-repellent gown with elastics, in white NWF; 1 Round cap with elastics, in white NWF; 2 Waterproof shoe covers, in light blue PVC.